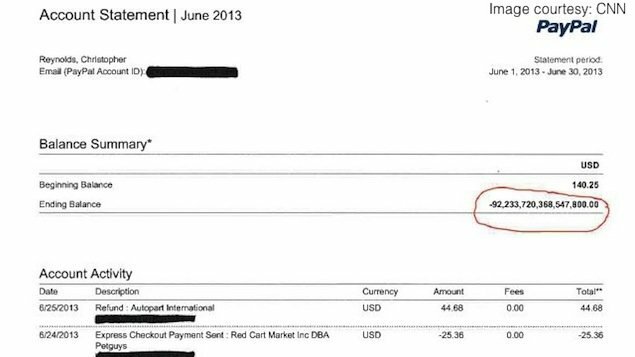 Online money-transfer firm PayPal has admitted it erroneously credited a man with $92 quadrillion. Chris Reynolds, 56, of Pennsylvania, found the amount when he opened his monthly statement. But the error was quickly recognized and his account had returned to zero by the time he had logged in. “This was obviously an error and we appreciate that Mr. Reynolds understands this was the case,” PayPal said in a statement. PayPal said it would offer to make a donation to a charity of Chris Reynolds’ choice. The $92,233,720,368,547,800 statement had been “quite a big surprise”, Chris Reynolds told the Philadelphia Daily News, which first reported the story.